This Foot Spa treatment combines the wonderful benefits of Himalayan Rock Salt with our range of natural therapeutic creams for an hour of relaxation and wellbeing. Himalayan Salt has been well known for helping with a multitude of health issues, including rejuvenating tired joints and muscles, repairing wear and tear or damage and injury. The addition of pure essential oils enhance these benefits. Our ‘Relax’ blend of Lemon, Lavender, Ylang Ylang, Roman Chamomile and Vetiver or our ‘Immune Boost’ blend of Ravensara, Fragonia, Eucalyptus, Lemon Scented Tea Tree and Vetiver can take you on a wonderful sensory journey. The combined effect with the essential oils is very calming and healing. It is like a healing paddle in the ocean (without the hazards of sharks or jellyfish! ), and has a relaxing decompressing effect, leaving you with a spring in your step! The Foot Spa Lamps have environmental benefits too. They ionise the air and create that wonderful sea air that makes us feel so much more alive! It ‘cleans’ the air, destroying ‘dirty’ atoms and is therefore helpful for people who may be prone to respiratory issues. 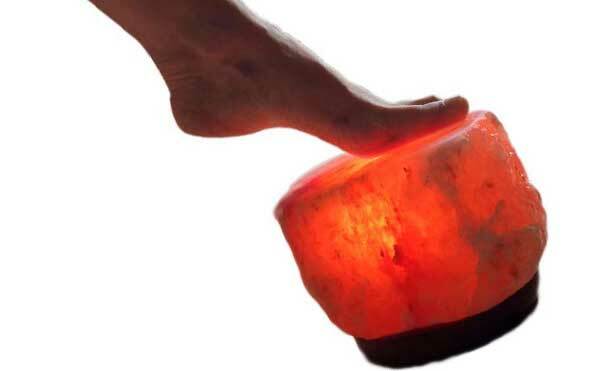 These unique Foot Spa Lamps, bath salts and hand held salt crystals are also available to purchase should you wish to continue the benefits at home.